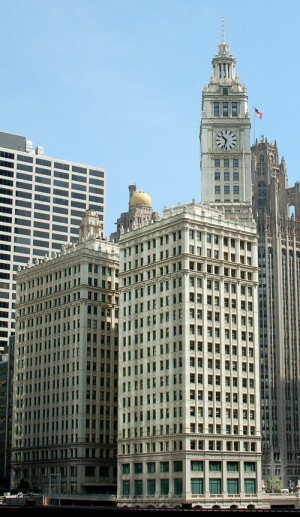 The Wrigley Building (400-410 North Michigan Avenue, Near North Side, Chicago, Illinois) is a skyscraper located directly across Michigan Avenue from the Tribune Tower on the Magnificent Mile. 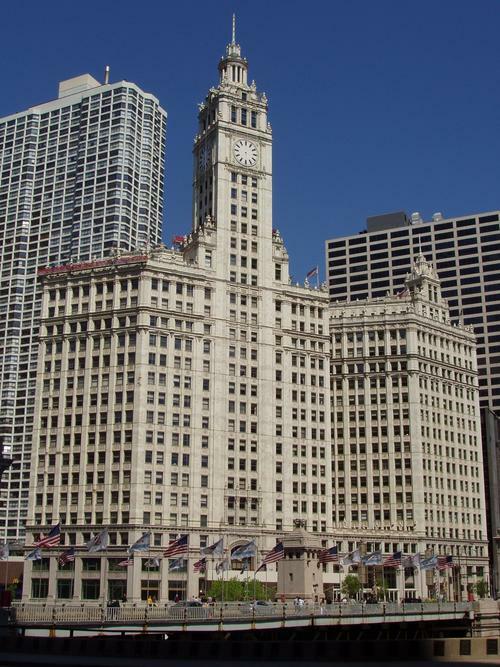 It was built to house the corporate headquarters of the Wrigley Company. When ground was broken for the Wrigley Building in 1920, there were no major office buildings north of the Chicago River and the Michigan Avenue Bridge, which spans the river just south of the building was still under construction. The land was selected by chewing gum magnate William Wrigley Jr. to headquarter his gum company. The building was designed by the architectural firm of Graham, Anderson, Probst & White using the shape of the Giralda tower of Seville's Cathedral combined with French Renaissance details. The 425-foot (130 m) south tower was completed in April 1921 and the north tower in May 1924. Walkways between the towers were added at the ground level and the third floor. 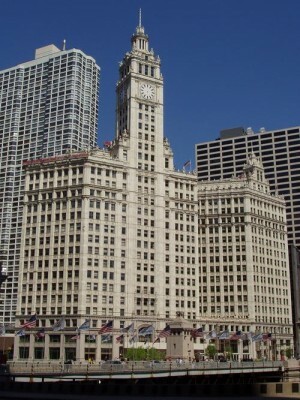 In 1931, another walkway was added at the fourteenth floor to connect to offices of a bank in accordance with a Chicago statute concerning bank branch offices.